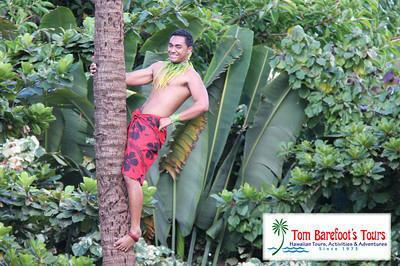 One of the most popular things to do in the state of Hawaii is the Polynesian Cultural center. 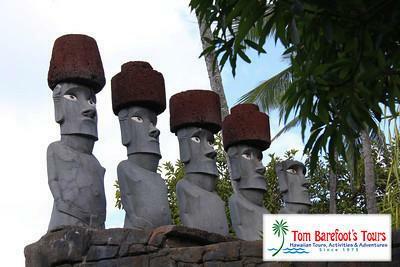 This attraction is located on the northern tip of Oahu is the town of Laie. Today we decided to travel up there from our hotel in Waikiki and see what it is all about. During a helicopter ride I recently went on I saw the massive Polynesian Cultural Center from the air so already had and idea of the enormous scale of what we were going to see. We opted to drive out ourselves so we could spend the morning enjoying the beaches of the north shore as well as a lunch at the famous shrimp trucks in Kahuku. We pulled into the parking lot of the Polynesian Cultural Center and then made our way towards the entrance gates where we checked in. The woman behind the counter was very nice and explained to us that our tour guide for the day would be with us momentarily. Sure enough, within about 30 seconds our guide rounded the corner and introduced herself to us and the other members of our group. She explained our itinerary for the day. We were going to start off by taking a tour of the various villages and cultural exhibits on the property. During this time we were also going to stop and watch the "Canoe Pageant" and we were also going to get to go on a canoe ride through the park. Then in the evening we were going to eat at their "Prime Dining Buffet" before we went to see the Horizons night show. The Canoe Pageant was one of my favorite parts of the day. I was really nice to get to sit in the shade and watch the various boat loads of dancers perform for us out on the double hulled canoes that were slowly moving through the central waterway. Before the show started there were some young men that were paddling a canoe around selling ice cream to people in the crowed. It was a really wholesome good time. After the Canoe Pageant we made our way through all of the various villages in the park. We saw all kinds of different cultural demonstrations including, how to build a fire from a coconut husk, how to climb a coconut tree and harvest a coconut, how to drum, how to dance, a traditional Maori greeting ceremony and much much more. 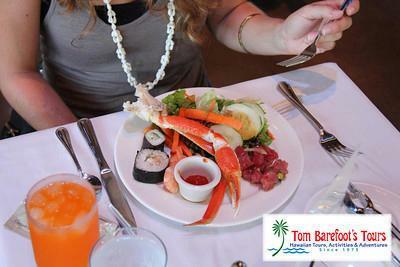 After all our daytime activities were over we moved to the huge banquet hall for our "Prime Dining Buffet". I was absolutely amazed at what I found when I got there. There was so much food! When I made my first plate I got to what I thought was the end of the buffet and made my way back to the table, my plate was stacked with an enormous amount of food. Then my girlfriend came back to the table and she had all kinds of items on her plate that I didn't even remember seeing at the buffet. When I asked her about them she pointed over to another buffet table (that was at least twice as long as the one I had visited) that was stocked with all kinds of dishes. I immediately felt foolish that I had missed out on the majority of the food so I forced myself to finish my plate so I could go back for more. I think that it's safe to say that the meal I ate was one of the largest I've had for a long, long time. After we were done with dinner we walked over to the "Horizons" night show. I was disappointed because I was not permitted to take any pictures inside the auditorium. So you'll have to trust me when I tell you that it was one of the most visually stimulating live performances I've ever seen in my life. The only show I've been to that was on par with this was "Cats" on Broadway in New York..........Our time at the Polynesian Cultural Center was absolutely amazing! Get admission into the park at 12:00pm and enjoy the authentic villages of seven Polynesian cultures with a small guided tour, island demonstrations, canoe pageant, a tram tour of Laie, a canoe tour and an exclusive entry line to the IMAX theater.